However determined the majority of Americans might have been in the 1930s to maintain the nation's long-established policy of isolation, there were still numbers of radicals, in both the United States government and services, who realised that almost certainly the day would dawn when, for one reason or another, the USA would have to become involved in warlike activities. Given such circumstances, one of the essential weapons would be an advanced strategic bomber, and in the US Army men like Colonels Hugh Knerr and C.W. Howard were working steadily away in the 1930s to ensure, to the best of their capabilities, that when the moment came such a bomber would be available. This thinking had led to the introduction into service of such bombers as the Boeing B-9, and the Martin B-10 and B-12. While it was appreciated that these did not represent the ideal, they prepared the way for the procurement of a true strategic bomber. In 1933 came the US Army's requirement for a design study of such an aircraft, then identified as the XBLR-1 (Experimental Bomber Long Range): a range of 8046km was included in the specification to provide long-range strategic capability. 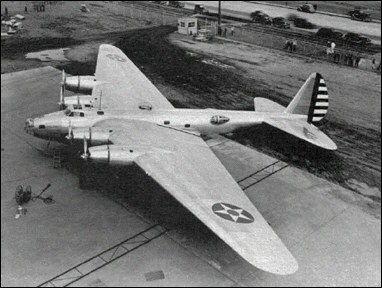 Both Boeing and Martin produced design studies, but it was the former company which received the US Army's contract for construction and development of its Boeing Model 294, under the designation XB-15. When this large monoplane flew for the first time, on 15 October 1937, it was then the largest aircraft to be built in the USA. As might be expected, it introduced a number of original features, including internal passages within the wing to permit minor engine repairs or adjustments in flight; two auxiliary power units within the fuselage to provide a 110-volt DC electrical system; sleeping bunks to allow for 'two-watch' operation; and the introduction of a flight engineer into the crew to reduce the pilot's workload. Intended to be powered by engines of around 1491kW, which in fact did not materialise for some years, the actual powerplant comprised four 746kW Pratt & Whitney Twin Wasp Senior radial engines, which meant that performance was far below that estimated. Purely an experimental aircraft, it was, however, provided with cargo doors and flown as a cargo transport during World War II under the designation XC-105. I am a little interested about the wing section that was used on this project. Was the Naca 5-digit (23-series) type section actual at that time or did they used an older type, i.e. NACA 4 digit or Clark Y wing section? I am impressed with the thickness of the wings, which allowed limited "inflite" maintenance, What are the dimensions of the wing at the root? and out to the outboard engine? curious, it appears that the wing cross section height is 60% of the maximum fuselage width. Am I correct I have used dividers crudely to deduce this. total wing and fuselage cross section measurements would also be helpful it is indeed a huge aircraft. All though the B-15 was not a service success, it's wings were those used for the Boeing 314 flying boat airliner of the late 1930s. The Jumbo of its day. I flew with my mother in a BOAC one in 1944 from Bermuda to Baltimore. 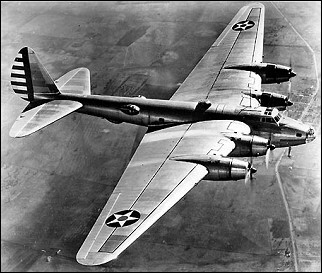 The XB-15 was the forerunner to the B-17. Unlike earlier comments that noted the B-307 was the forerunner to the famed bomber, many of the components of the B-307 were combined with the XB-15 that ultimately resulted in the B-17. If one looks at the first run of the B-17, it would be difficult to tell the difference between the XB-15 and the original B-17. In none of the many articles written about the Boeing XB-15/XC-105 is it ever stated where it was built. They should have just gone with the R-2000 with similar dimensions. It's too bad the project failed. incorporated into that of the Boeing 314 Flying Clippers. i'm doing a report on the B-17s. Can someone tell me more about it. Sgt.KAR98 what do you mean primitive B-17 have you looked at the Boeing b-299,Y1B-17 or B-17B-D? It is a beautiful airplane all wing. Part of the XB-15 design parts were incorporated into the boeing b-299,Y1B-17 and B-17B. The Gun Blisters on the side of the fuselage are identical. The Nose turret glass section is identical also. There are 3 Small half round turrets on the XB-15 Nose, Belly fron and Belly rear. I am scratch building a 1/72 scale version of the XB-15. The 1930s were full of underpowered giant planes. The technology window allowed them to be built (mostly in ones and twos) but didn't allow more hp per engine. That took R&D money, which depended on a war. No,I said it looks an early B-17,not an obsolete plane. Even the F-15 can be considered obsolete today,if you�re counting on the US techno fever. With those ultrawide wings and speeds it looks very primitive today. But it should 've been a marvel during the years of its development and induction. Afterall what would 've been the time spent in developing and flight testing it! Is in't it history? � The wing was so thick at the root that it was possible for a crew member to service the engine accessory secrions in flight from a passageway extending behind the nacelles. � With a range of over 8000km, the XB-15 was equipped with bunks to allow some crew to test during the mission. � The XB-15 was fitted with a large cargo door and hoist to become the XC-105. Its great lifting capacity and range (if not speed) made it well suited to transport missions to and from the Panama Canal Zone. � The XB-15 was heavily armed for its day, having six machine guns in blisters and turrets. Later B-17s would need twice this much weaponry.